Citation: Lobreglio G, Cofano P, Greco M (2017) Updates in Seropositivity for West Nile Virus Antibodies in Myasthenia Gravis. J Autoimmune Disord Vol 3:38. Copyright: © 2017 Greco M, et al. This is an open-access article distributed under the terms of the Creative Commons Attribution License, which permits unrestricted use, distribution, and reproduction in any medium, provided the original author and source are credited. Background: Myasthenia gravis (MG) is a chronic autoimmune disease affecting skeletal muscle characterized by autoantibodies distrupting normal signal transmission at neuromuscular junction; in most of cases antibodies are directed against acetylcholine receptor (AChR-Ab) and in a lower percentage of cases against muscle-specific tyrosine kinase (MuSK-Ab) or other antigens defining different disease subgroups. Mechanism of insurgence of MG has not been completely understood yet; recent evidences reported the development of MG after infection by West Nile virus (WNV), causative agent of neuroinvasive disease mainly transmitted with the bite of infected mosquitoes; moreover our previous results showed seropositivity for WNV antibodies in AChR-seropositive MG patients. A further analysis of patients affected by MG has been here conducted with the aim of expanding the screening for WNV-Ab to more patients and also subgrouping them on the basis of anti MuSK or anti AChR seropositivity. Method and findings: We analyzed the serum from futher 10 MG patients seropositive for AChR-Ab and from 3 patients with MuSK-Ab but not AChR-Ab-seropositive, together with 20 control sera, for detection of WNV antibodies. Seropositivity for anti WNV IgG was obtained in 38% of MG patients, of which 23% were AChR-Ab positive and 15% were MuSK-Ab positive, although no previous WNV infection was reported. Control samples didn’t show seropositivity for anti WNV antibodies, except one who had ANCA-positive vasculitis and was also subjected to blood transfusion, a possible vehicle of WNV virus. Discussion: Together with previously published data, total percentage of 23% seropositivity for WNV antibodies has been found in MG patients. It appears possible that viral antigen could break immunological self-tolerance by mechanisms of molecular mimicry between virus proteins and AChR subunits and/or MuSK and that this mechanism could be related to MG insurgence. AChR-Ab: Anti Acetylcholine Receptor Antibodies; ANCA: Anti Neutrophil Cytoplasmic Antibodies; IFA: Indirect Immunofluorescent Antibody; FITC: Fluorescein Isothiocyanate; MG: Myasthenia Gravis; MuSK-Ab: Anti Muscle-Specific Tyrosine Kinase Antibodies; WNV: West Nile Virus. Several factors are thought to contribute to the insurgence of autoimmune disease including differences in genotypes, hormonal setting and environmental factors [1-4]; among these last factors there are infections caused by virus, bacteria or other pathogens. In fact it has been widely documented the important role of infections in the induction of autoimmune disorders such as disease seasonal onset, disease occurrence after some infections, and the isolation of viral nucleic acids from affected tissues of patients [5-7]. Myasthenia gravis is an autoimmune disease in which signal transmission at the neuromuscular junction is blocked at postsynaptic membrane level because of autoantibodies binding, in majority of cases, to acetylcholine receptors or, to a less extend, to muscle-specific kinase or lipoprotein related protein 4 (LPR4) or to other post synaptic antigens . MG is characterized by generalized or localized weakness of skeletal muscles which nearly always includes eye muscles, sometimes asymmetrically, with diplopia and ptosis , while the pattern of involvement is usually symmetric, and weakness typically increases with exercise and repetitive muscle use and varies over the course of a day. Detection of specific antibodies together with clinical signs and symptoms determine the diagnosis for MG and define disease subgroups. Very little is known about the insurgence of the disease; one hypothesis is that autoimmunity could be initiated by virus infections as trigger of the autoimmune process and break of the immunological self-tolerance . We recently reported seropositivity for WNV antibodies in a group of patients affected by myasthenia gravis  and previous work described 6 cases of MG that developed after infection by WNV ; this neurotropic flavivirus, transmitted by mosquitoes bite, can be asymptomatic or it can be the causative agent of benign West Nile fever and West Nile neuroinvasive disease in humans characterized by encephalitis, menigitidis, poliomyelitis . These evidences support the hypothesis that WNV infection could start an autoimmune process possibly through molecular mimicry between virus antigens and acetylcholine receptors. In the present work we aimed to further extend the analysis for WNV-Ab detection not only to AChR-Ab seropositive MG patients, but also to subgroup with autoantibodies to muscle-specific tyrosine kinase (MuSK-Ab), but without AChR-Ab. Myasthenia gravis with muscle-specific kinase antibodies accounts for 1 to 10% of cases , while presence of antibodies to the nicotinic acetylcholine receptor (AChR) are most common, with a percentage o seropositivity of 80% of adults with generalized myasthenia gravis . This disorder is more common in the Mediterranean area of Europe than in northern Europe and is also more common in the northern regions of East Asia than in the southern regions . The reason for this variation is thought to be a genetic predisposition rather than environmental factors. Patients with myasthenia gravis and muscle-specific tyrosine kinase antibodies, as compared with patients without these antibodies, have more severe weakness, sometimes with muscle atrophy, and have marked symptoms from facial and bulbar muscles. Limb weakness and ocular weakness are less common and fluctuations in muscle strength are less pronounced than in disease characterized by acetylcholine receptor antibodies. Antibodies against WNV were evaluated by indirect immunofluorescence in serum obtained from 13 newly diagnosed MG patients, 10 of them were seropositive for AChR-Ab (8 males and 2 females, 34-98 and 70-83 age range, respectively) while 3 were seropositive for MuSK-Ab (1 male and 2 females, 63 years old and 47-69 age range, respectively); only one AChR-Ab seropositive patient had a tumor of the thymus. As control population we evaluated 20 patients with myosistis or autoimmune diseases such as rheumatoid arthritis, vasculitis, systemic lupus erythematosus, autoimmune hepatitis and atrophic gastritis or with myopathies induced by statins therapy; all control patients were newly diagnosed for autoimmune diseases with the exception of the patient affected by vasculitis who was under immunosuppressive drugs treatment. Indirect Immunofluorescent Antibody method was used to evaluate the presence of anti-WNV antibodies in patients sera after incubation on cells infected by WNV, according to manufacturer directions (Anti-West Nile virus IFA, Euroimmun, Lübeck, Deutschland). Shortly, 30 ul of 1:10 diluted patients sera were incubated on the substrate (WNV infected and non-infected cells for each sample) for 30 minutes, than washed twice with PBS-Tween for 5 minutes, incubated with 25 ul of fluoresceine-coniugated secondary antibody (anti human IgG) for 30 minutes and finally washed with PBS-Tween for 5 minutes. FITC fluorescence was observed by microscopy. Negative control (cells not infected by WNV) was used to exclude aspecific reaction for each patients sera. AChR-Ab were detected by quantitative radioimmunoassay according to manufacturer directions (ACHR-AB, Cisbio Bioassays, France). MuSK-Ab were detected by quantitative radioimmunoassay according to manufacturer directions (RSR Ldt, UK). Patients with myasthenia gravis analyzed in the present work belonged to the two known subgroups of the disease with different seropositivity for autoantibodies; we found that 77% of them were positive for anti-AChR autoantibodies while 23% were positive for anti-MuSK autoantibodies (Table 1). As control patients, we analyzed individuals with autoimmune diseases such as rheumatoid arthritis, ANCA-associated vasculitis, systemic lupus erythematosus, autoimmune hepatitis and atrophic gastritis, with muscle inflammation or with myopathies induced by statins therapy, a disorder characterized by muscle weakness, muscle-cell necrosis, and the presence of autoantibodies against 3-hydroxy-3-methylglutaryl coenzyme A (HMG-CoA) reductase  in order to specifically associate the presence of anti WNV-Ab with the possible insurgence of MG. The presence of anti WNV-Ab in patients sera was detected in 3 out of 10 AChR-Ab seropositive MG patients (30% of the subgroup) and in 2 out of 3 MuSK-Ab seropositive MG patients (67% of the subgroup), although none of the patients have previously reported any clinical manifestation of WNV infection. No correlation was found between levels of autoantibodies against AChR or MuSK and intensity of fluorescent signal for anti WNV-Ab. Seropositivity for WNV-Ab was found in 38% of all MG patients, of which 23% were AChR-Ab positive and 15% were MuSK-Ab positive (Figure 1). In controls population, which include patients affected by other autoimmune diseases, we find positivity for anti WNV-Ab only in one patients with ANCA-associated vasculitis who was also subjected to blood transfusions. Figure 1: WNV-Ab seropositivity in MG patients. 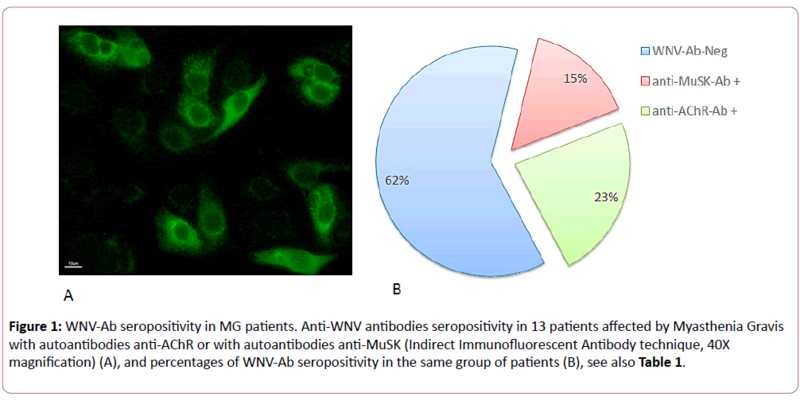 Anti-WNV antibodies seropositivity in 13 patients affected by Myasthenia Gravis with autoantibodies anti-AChR or with autoantibodies anti-MuSK (Indirect Immunofluorescent Antibody technique, 40X magnification) (A), and percentages of WNV-Ab seropositivity in the same group of patients (B), see also Table 1. Table 1: Seropositivity for anti-AChR-Ab and antiMuSK-Ab evaluated in MG patients. Majority of MG patients here analyzed were male (62%), while the presence of anti WNV antibodies was observed in 15% of males and 23% of females. We report an update of our previous data on the evaluation of WNV antibodies in the serum of patients affected by myasthenia gravis, AChR-Ab seropositive variant, by extending number of analyzed MG patients and including MuSK-Ab positive MG individuals. Our previous results  indicated a 17% seropositivity for WNV-Ab in a group of 29 MG patients all seropositive for AChR-Ab. In the present work we further analyzed 13 more MG patients and we confirmed a total percentage of 38% for WNV-Ab seropositivity (Table 1), of which 23% were AChR-Ab positive sera, i.e. 3 patients out of 13 MG patients, while 15% were MuSK-Ab positive, i.e. 2 patients out of 13 MG patients (Figure 1). Significance level of association between WNV-Ab seropositivity and MG was evaluated by Chisquared test, obtaining P=0.0005. By considering total number of samples included in the two studies, we are able to enlarge our sample population to a total number of 42 individuals and a to estimate a whole percentage of 23% of seropositivity for WNV antibodies in MG patients (p<0.05 by Chi-squared test). Total results appear of great interest in context of the understanding the mechanism at the basis of myasthenia gravis insurgence. Anti WNV seropositivity appears specifically associated to MG for several reasons. First, because it is not present in other autoimmune disease patients analyzed as control population (such as rheumatoid arthritis, systemic lupus erythematosus, autoimmune hepatitis and atrophic gastritis) with the exception of one patients with ANCA-associated vasculitis who was also subjected twice to blood transfusions; not surprising result since transmission of WNV through blood transfusion has been documented when donors are not screened with the nucleic acid-based assay for WNV . Second reason, because our findings are in accordance with previous data describing MG developed after WNV infection  and with several data suggesting that autoimmune diseases may result from the triggering of immune pathways by virus or other pathogens [19,20]. Some mechanisms may explain the pathway by which infection leads to autoimmune activation: molecular mimicry, with cross-reactivity between virus antigens and epitopes of self antigens; exposure of cryptic antigens, which are exposed from the cell following tissue injury, cell death and oxidative stress associated to the infectious process itself; polyclonal activation; bystander T-cell activation, with the expansion of immune response towards different self-antigens [21,22]. Although possible viruses involvement in autoimmune disease insurgence is a recognized mechanism of disease development, only few viruses have been already identified as responsible of the initiation of systemic and/or organ specific autoimmune disease, among them hepatitis C virus, Dengue virus, EBV [22-26]. The majority of MG cases, almost 80%, are AChR-Ab seropositive while 1-10% are MuSK-Ab positive and their presence is correlated with a more severe weakness, sometimes with muscle atrophy and marked symptoms. Moreover MG with MuSK-Ab is not manifested as ocular myasthenia, whereas both AChR-Ab or LRP-Ab can be found in the ocular subgroup [8,9]. On the bases of these different variants of the disease we further analyzed MG patients with MuSK-Ab and we found a similar anti WNV seropositivity with respect to MG patients with AChR-Ab (15% and 23%, Figure 1). WNV infection, both as benign West Nile Fever or as neuroinvasive disease, have been associated to long-term sequelae such as physical, cognitive, psychological, functional consequences in affected patients , with the presence of difficulties in performance activities of daily doing in about 50% of patients and development of to some extent more severe difficulties such as muscle weakness, fatigue and myalgia or other condition as depression, memory loss and difficulty concentrating in 15-20% of patients. In the extended number of MG patients (42 individuals) analyzed the present and previous study  we found that percentages of WNV seropositivity (23%) were similar to percentages reported for more severe long-term sequelae observed after WNV infection (15-20%). Also older age range in MG seropositive for WNV-Ab (62-83 years old) has similar trend of those observed in long term sequelae after WNV infection by Patel et al. . These observations lead to formulate the hypothesis of a possible involvement of autoimmune disease as a mechanism in incomplete overall recovery from WNV-related illness and long-tem sequelae. On the basis of our data, by expanding the sample population of MG patients screened for the presence of WNV-Ab, it appears further plausible the implication of WNV infection in the triggering of autoimmune machinery for MG initiation by mechanisms of molecular mimicry between virus antigens and both AChR or MuSK subunits at the neuromuscular junction, able to break normal immune-tolerance towards self-antigens, destroy the normal signal transmission at synapse level and initiate autoimmune disease. Given that the identification of a specific virus or pathogens exclusively responsible for the initiation of an autoimmune response has been so far reached in a minority of cases of autoimmune disease following viral infection, the confirmation and extension of our previous finding  of association between WNV and MG insurgence that here reported appears of great interest, albeit a still small population has been analyzed and further work is needed to extensively confirm the involvement of WNV infection in the autoimmune process of myasthenia gravis. The research work described in this manuscript was performed according to approved scientific guidelines. All patients gave their informed consensus for treatment of personal data and biological samples. All the listed authors have actively participated in groundwork, research and tuition of this current work. We thanks Euroimmun Italy for kindly providing reagents for WNVAb evaluation. Authors attest that there is no conflict of interest with any financial organization regarding the items discussed in the manuscript. Shoenfeld Y, Gilburd B, Abu-Shakra M, Amital H, Barzilai O, et al. (2008) The mosaic of autoimmunity: genetic factors involved in autoimmune diseases. Isr Med Assoc J 10: 3–7. Shoenfeld Y, Zandman-Goddard G, Stojanovich L, Cutolo M, Amital H, et al. (2008) The mosaic of autoimmunity: hormonal and environmental factors involved in autoimmune diseases. Isr Med Assoc J 10: 8–12. Shoenfeld Y, Blank M, Abu-Shakra M, Amital H, Barzilai O, et al. (2008) The mosaic of autoimmunity: prediction, autoantibodies, and therapy in autoimmune diseases. Isr Med Assoc J 10: 13–19. Sarzi-Puttini P, Atzeni F, Iaccarino L, Doria A (2005) Environment and systemic lupus erythematosus: an overview. Autoimmunity 38: 465– 472. Zampieri S, Ghirardello A, Iaccarino L, Briani C, Sarzi-Puttini P, et al. (2006) Polymyositis-dermatomyositis and infections. Autoimmunity 39: 191–196. Chevrel G, Calvet A, Belin V, Miossec P (2000) Dermatomyositis associated with the presence of parvovirus B19 DNA in muscle. Rheumatology 39: 1037–1039. Yousef GE, Isenberg DA, Mowbray JF (1990) Detection of enterovirus specific RNA sequences in muscle biopsy specimens from patients with adult onset of myositis. Ann Rheum Dis 49: 310–315. Gilhus NE (2016) Myasthenia Gravis. N Engl J Med 375: 2570-2581. Gilhus NE, Verschuuren JJ (2015) Myasthenia gravis: subgroup classification and therapeutic strategies. Lancet Neurol 14: 1023-1036. Sfriso P, Ghirardello A, Botsios C, Tonon M, Zen M, et al. (2010) Infections and autoimmunity: the multifaceted relationship. J Leukoc Biol 87: 385-395. Greco M, Cofano P, Lobreglio G (2016) Seropositivity for West Nile Virus Antibodies in Patients Affected by Myasthenia Gravis. J Clin Med Res 8: 196-201. Leis AA, Szatmary G, Ross MA, Stokic DS (2014) West nile virus infection and myasthenia gravis. Muscle Nerve 49: 26-29. Centers for Disease Control and Prevention (CDC). West Nile virusinfection: clinical description. http://www.cdc.gov/ncidod/dvbid/westnile/clinicians/clindesc.html. Guptill JT, Sanders DB, Evoli A (2011) Anti-MuSK antibody myasthenia gravis: clinical findings and response to treatment in two large cohorts. Muscle Nerve 44: 36-40. Hong Y, Li HF, Skeie GO, Romi F, Hao HJ, et al. (2016) Autoantibody profile and clinical characteristics in a cohort of Chinese adult myasthenia gravis patients. J euroimmunol 298: 51-57. Mammen AL (2016) Statin-Associated Autoimmune Myopathy. N Engl J Med 374: 664-669. Pealer LN, Marfin AA, Petersen LR, Lanciotti RS, Page PL, et al. (2003) Transmission of West Nile virus through blood transfusion in the United States in 2002. N Engl J Med 349: 1236-1245. Pollard KM, Kono DH (2013) Requirements for innate immune pathways in environmentally induced autoimmunity. BMC Med 11: 100. Lin YS, Yeh TM, Lin CF, Wan SW, Chuang YC, et al. (2011) Molecular mimicry between virus and host and its implications for dengue disease pathogenesis. Exp Biol Med (Maywood) 236: 515–523. Ercolini AM, Miller SD (2009) The role of infections in autoimmune disease. Clin Exp Immunol 155: 1–15. Ramos-Casals M, Munoz S, Medina F, Jara LJ, Rosas J, et al. (2009) Systemic autoimmune diseases in patients with hepatitis C virus infection: characterization of 1020 cases (The HISPAMEC Registry). J Rheumatol 36: 1442–1448. Liu IJ, Chiu CY, Chen YC, Wu HC (2011) Molecular mimicry of human endothelial cell antigen by autoantibodies to nonstructural protein 1 of dengue virus. J Biol Chem 286: 9726–9736. Loebel M, Eckey M, Sotzny F, Hahn E, Bauer S, et al. (2017) Serological profiling of the EBV immune response in Chronic Fatigue Syndrome using a peptide microarray. PLoS One 12: e0179124. Poole BD, Scofield RH, Harley JB, James JA (2006) Epstein-Barr virus and molecular mimicry in systemic lupus erythematosus. Autoimmunity 39: 63-70. Balandraud N, Roudier J (2017) Epstein-Barr virus and rheumatoid arthritis. Joint Bone Spine pii: S1297-319X(17)30093-3. Patel H, Sander B, Nelder MP (2015) Long-term sequelae of West Nile virus-related illness: a systematic review. Lancet Infect Dis 15: 951-959.